Our Lent talks series this year follow the theme Last Words — Jesus’s last words from the cross. We begin with an Ash Wednesday communion service led by Revd Roy Kilner at 12.45 on Wednesday, 18th February. 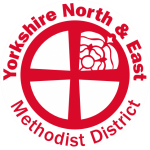 For the talks themselves our own minister, Revd Christopher Humble, is joined by two other ministers in the York circuit for talks on Wednesdays at 12.45. A light lunch is available from 11.45.